ISIS is defeated, and the Syrian Defence Forces (SDF) announced the capture of thousands of ISIS terrorists in their custody, and the wives and children of the terrorists were taken to camps in north east Syria. The question on many minds is: where do these terrorists go? Who has the capacity and resources to house thousands of blood thirsty terrorists who are well known for chopping off heads? Some of the terrorists have been moved to the US Base at Al Tanf and have been recycled into security contractors on the US payroll, while their wives and children will be held hostage in a camp in order to assure compliance. Their task is to prevent the Syrian Arab Army or their allies from recovering the oil and gas wells, and to create chaos and instability in Syria for the purpose of thwarting the peaceful recovery. 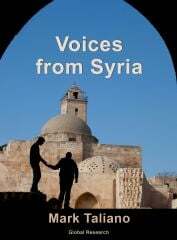 The US military were hampered by not being able to invade Syria with a large force in order to accomplish the US strategic goals of regime change and resource acquisition. Unlike the massive invasion and direct involvement of the American military in Iraq and Libya; the Pentagon and CIA were forced to use ‘assets on the ground’. The Free Syrian Army (FSA) was the first asset on the ground, and later was usurped by the Al Qaeda branch in Syria: Jibhat al Nusra. ISIS emerged from the shadows in Iraq, and came to center stage in Reqaa eventually holding much of Syria, and took possession of the life-blood of Syria: the oil and gas wells. 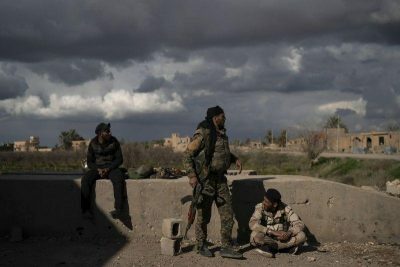 Finally, ISIS was defeated by a US Coalition ally: the SDF, a militia made up of Syrian Kurds and Syrian Arab tribes who took the oil wells which had made ISIS wealthy. Now, in the last phase of the Syrian conflict, some of the ISIS prisoners are being recycled as armed support for the small group of American soldiers and officers at Al Tanf. The convoy of escorted ISIS was six to seven kilometers long, and included almost 50 trucks, 13 buses and more than 100 of ISIS vehicles. The SDF escorted the convoy to a location in the desert, and while the US did not accompany the convoy, they did fly overheard providing lighting in the desert night. The US strategy on Syria is to make sure the Syrian government in Damascus is denied peace, security and revenues to rebuild. The US-NATO attack on Syria was for the purpose of regime change, and their jihadist ground troops, such as FSA and Al Qaeda branches, failed to achieve the desired outcome. What they failed to win on the battlefields, they want to win in the aftermath of their own defeat. The core US-NATO strategy is to prevent recovery in Syria until regime change is achieved. The US-NATO officials continue to chant the mantra “there is no military solution in Syria”, and yet that was exactly what they were fighting for, but they lost. The Russian Air Force arrived in 2015 and changed the course of the war. In the aftermath of the US-NATO defeat, they expect to gain what they lost on the battlefield. They still expect to remove an elected President, discard a constitution ratified by public vote in 2012, and install an interim President groomed from the ranks of the Muslim Brotherhood. Their goals have been shattered by the will of the Syrian people and their government, who were steadfast in their resistance to terrorism, and their secular values which remain totally incompatible with the US sponsored opposition.